Clowns have undergone quite a bit of a change in the last several decades. No longer are they the delightful and cheerful harlequins that bring giggles and laughter. Let’s be honest, they’ve gone from jolly-makers to practically horror-bringers! But, whether they’re committing some horrific comedy or some hilarious terror, they’ve given us a ton of different images to enjoy throughout the years. Are we looking at the circus hobo, the crying bozo, or perhaps the sneaky jester? 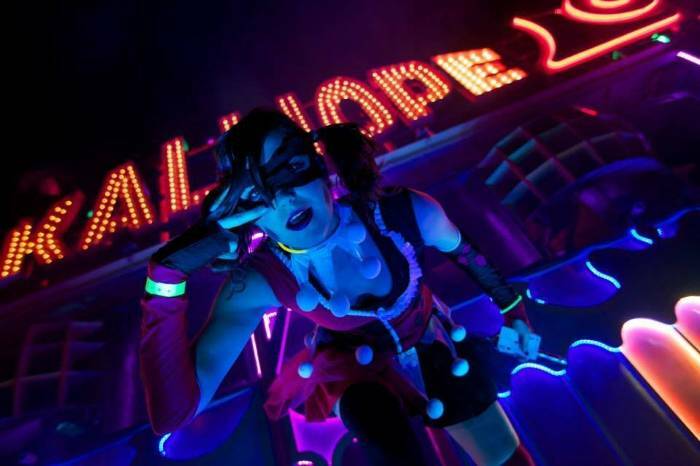 Of course, if we’re going to talk about jesters, especially crazy hysterical ones, we must find our way into the depths of the Arkham Asylum of Gotham to inquire how everyone’s favorite harlequin has been up to: Harley Quinn! The lass who might have the greatest chance of pinning down what makes an Arkham Archvillain tick would be the lady who was putting the Joker’s brain in the shrinker to start. After staring so long into the minds of Arkham lunatics, only the brilliant psycho-therapist could manage to make fashion and murder look fantastically funny. 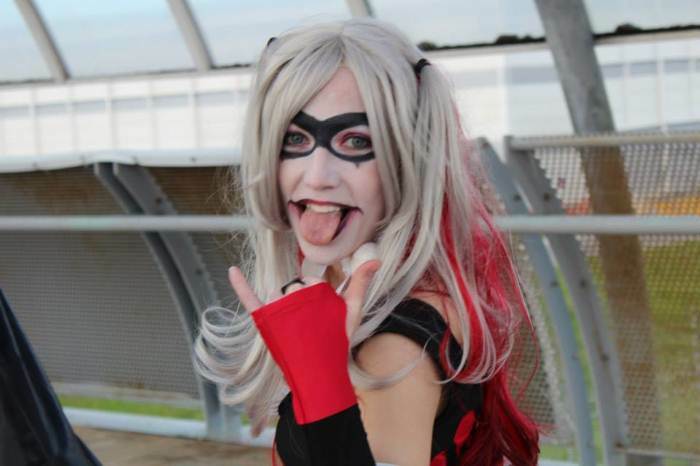 Of course, you can, too, with this Women’s Harley Jester costume. The black and red Joker card themed diamond pattern makes this jester dress look like you’ve just broke out of the loony bin and are ready to make everyone die of laughter. 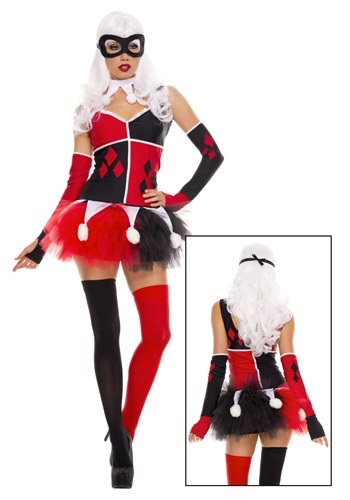 The red and black pattern holds throughout the tulle overlay skirt and the matching diamond-print arm warmers. To protect your true identity, the black eye mask ties comfortably with black ribbon. 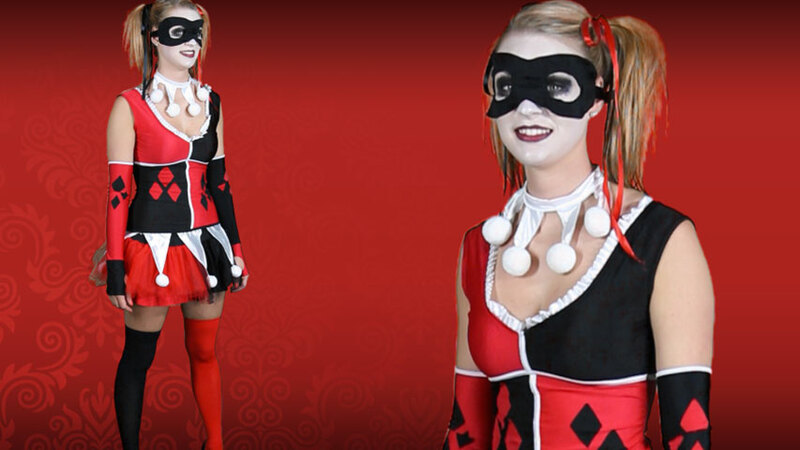 Complete the look with your choice of Harley’s favorite shoes and a platinum blonde wig and the only thing you need to finish painting the town red (and black) will be your own Mr. J! I like that it was a complete costume and I didn't have to purchase a bunch of add on items --- def always order BIGGER in size as they always run small, I'm a size 3 and I the M/L was mini on me. Honestly was so surprised by my costume. the quality is amazing.... even the nylon sock things are a nice thick, good quality material. I ordered a S/M and it just fit me, so pay close attention to the size chart! The tutu is also very short, which doesn't bother me (I just wear something underneath), but it may bother others, but other than that... highly recommended!! !